Commissioned by the Gallery’s trustees in 1916, soon after the start of the Great War, The offerings of War and The offerings of Peace were created by English sculptor Gilbert Bayes (1872-1953). Allegedly influenced by the Elgin marbles, they also embodied the aesthetics of the Edwardian period. The figure of 'War’ holds a staff topped with Winged Victory and has a bundle of broken swords and spear shafts by his side, while 'Peace’ presents offerings of the Arts and Plenty, showing that Peace, and not War, is the best victory. Due to metal shortages during World War I, there was considerable delay in the sculptures’ completion. Although plaster maquettes about 18-inches high had initially been submitted in 1915, the final works were not cast until 1923, in the foundry of AB Burton, Thames and Ditton, London. 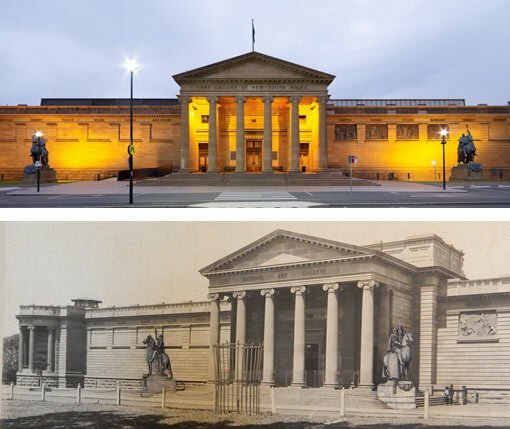 They were then briefly displayed outside the National Academy of Art in London, before being shipped in wooden crates to Australia – War at the end of 1923 and Peace in the middle of 1924. 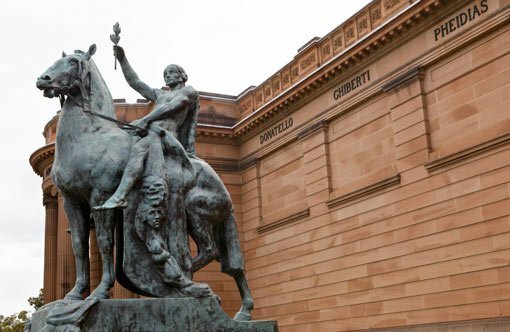 After much deliberation about the correct positioning, the sculptures were installed in their current position outside the Gallery in 1926. Designs from the time show an alternative location with the sculptures inset into the bottom of the entrance stairs. The sculptures were last conserved in 1993 when they were cleaned and treated with a protective wax coating. Since then the wax has deteriorated due to exposure to Sydney’s harsh environment. 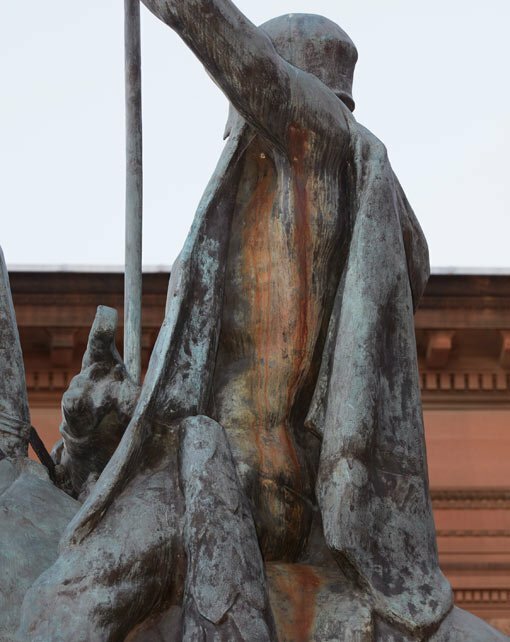 The bronze metal of Peace appears to be in a more stable condition than War which has some surface discolouration suggesting there may be some corrosion of the bronze underneath the protective wax. Re-waxing is an established part of scheduled maintenance for outdoor bronzes. The 2017 conservation works, which will take about six weeks, involve cleaning with pressurised water to remove deteriorated wax, dirt and grime and allow a detailed inspection of the condition of the metal. The surface will be checked and treated for corrosion prior to recoating with a micro crystalline wax. The work is being funded by the Minister’s Stone Program. Launched in 1991, this program provides for the ‘catch-up’ maintenance of NSW government-owned heritage assets (primarily stone buildings and monuments) and is managed by Public Works Advisory, NSW Department of Finance, Services & Innovation.